The Camelbak Chute .75L water bottle is designed for hydration on demand, whether you're in the backcountry or sitting at your desk. The ergonomic high-flow spout is angled and contoured for efficient, full-on hydration. The leak-proof, tethered cap twists off with just half a turn and conveniently snaps into the handle so it's out of the way when you're drinking. 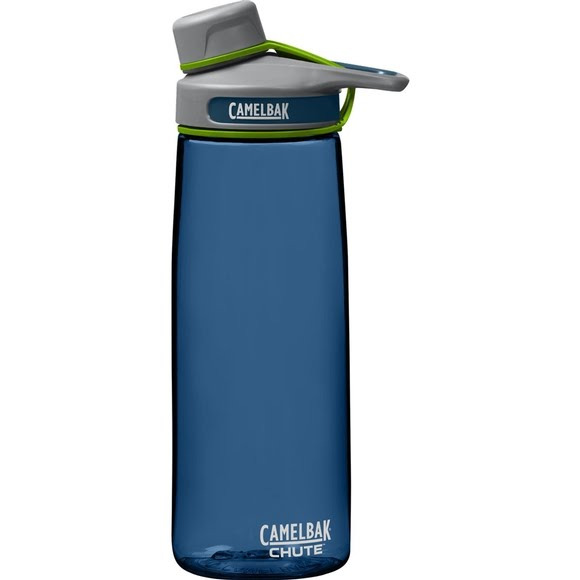 The Camelbak Chute .75L water bottle is designed for hydration on demand, whether you&apos;re in the backcountry or sitting at your desk. The ergonomic high-flow spout is angled and contoured for efficient, full-on hydration. The leak-proof, tethered cap twists off with just half a turn and conveniently snaps into the handle so it&apos;s out of the way when you&apos;re drinking. They even put the threads for the cap on the inside of the spout so you get a comfortable lip seal. And the one-piece tether is twice as clever as any you&apos;ll see on the market. It keeps the top locked out of your way for one-handed refills on the go.